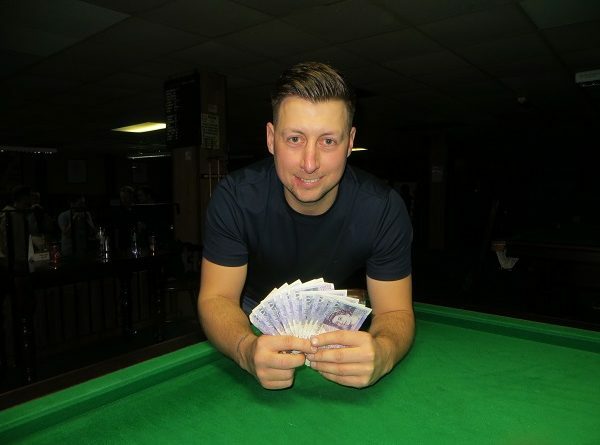 The 33-year-old from Longcross compiled the day’s highest break of 121 in the deciding frame of his 2-1 victory over Mark Lloyd (Gosport) in the final. And, remarkably, he hadn’t even played one shot with his new tip before the event hosted and sponsored by Top Spot Snooker Club. Harvey took the opening frame with a break of 60 but missed a black off its spot on a run of 39 in the next. New rankings leader Lloyd replied with a 44 and eventually squared the match on the colours. But the 19-year-old former national junior champion, who collected £100, was destined to have only one more shot. He broke off in the decider. Harvey fired in a long red and by the time he left the table only pink and black remained and 121 points were on the scoreboard. Harvey reckoned his friend James Cullen had done a “good job” fitting the new tip. He said: “I managed to scrape through a few early frames and started knocking it in a bit. I just got better and better as I went on. “It’s always nice to win in one visit. That’s the aim every time I come to the table. Explaining why he “didn’t hit a ball” for two-and-a-half years until May this year, Harvey, a winner of a string of amateur titles, said: “I’ve got two young kids, work and I just lost a bit of interest. And why did he return? “I missed it,” he simply said. Earlier, Harvey finished second in his four-man round-robin group after losing 2-1 to Pascal Richard (Gosport). And he nearly made a last-16 exit. His opponent Ryan Mears (Aldershot) missed a black over the pocket for 2-0. Ross Barker (Oxford) and 15-year-old Mickey Joyce (Basingstoke) picked up £55 each following 2-0 semi-final defeats by Lloyd and Harvey respectively. The 41-strong field returned 35 breaks of 50 or more. Salisbury Snooker Club hosts the fourth leg of eight on Sunday, December 16. Follow Top Spot SC on www.facebook.com/topspotsnookercentre. Sean Harvey: 121, 87, 77, 70, 60, 51, 50. Mark Lloyd: 81, 77, 60, 58, 54, 50. Paul Bunyard: 81, 63, 54, 51. Connor Benzey: 70, 68, 63, 54. Ryan Mears: 68, 55, 52. GROUP A: 1st, Jamie Wilson (Waterlooville Sports Bar); 2nd, James Height (Break N Dish, Street, Somerset); 3rd, James Cullen (Woking SC); 4th, Ian Desmier (Break N Dish, Street, Somerset). GROUP B: 1st, Mark Lloyd (Stoke SC, Gosport); 2nd, Bobby Terry (Hampshire); 3rd, Bradley Parker (Sunninghill Comrades Club); 4th, Andrew Vernon (Reading). GROUP C: 1st, Pascal Richard (Mayfair, Gosport); 2nd, Sean Harvey (Staines Cons); 3rd, Arron Smith (Selsey RBL); 4th, Stanley Bunker (Bracknell). GROUP D: 1st, Ronnie Blake (Frames, Coulsdon); 2nd, Paul Bunyard (Sunninghill Comrades Club); 3rd, David Rice (Salisbury SC); 4th, Callum White (Waterlooville Sports Bar). GROUP E: 1st, Ross Barker (Abingdon Cons); 2nd, Jack Smithers (Frames, Coulsdon); 3rd, Pete Ferguson Snr (Portsmouth); 4th, Mick Sutton (Hampshire). GROUP F: 1st, Ryan Mears (Sovereign, Farnborough); 2nd, Anthony Rice (Salisbury SC); 3rd, Stewart Crosswell (Churchills, Eastleigh); 4th, George Heatley (Woking SC). GROUP G: 1st, Adam Nash (Churchills, Eastleigh); 2nd, Connor Benzey (Chandlers Ford SC); 3rd, Steve Wheatland (Chandlers Ford SC); 4th, Mark Ridout (Greenbaize, Bournemouth). GROUP H: 1st, Elliott Weston (Top Spot, Havant); 2nd, Mike Trigg (Cue T’s, Marchwood); 3rd, Martin Wallace (Crucible, Newbury); 4th, Darren Johnson (Petersfield Bowling & SC). GROUP I: 1st, Mickey Joyce (Academy, Basingstoke); 2nd, James Budd (Stoke SC, Gosport); 3rd, Harry Weston (Top Spot, Havant); 4th, Chloe White (Waterlooville Sports Bar). GROUP J: 1st, Christian Chislett (Churchills, Eastleigh); 2nd, Steven Hughes (Chandlers Ford SC); 3rd, Pete Ferguson Jnr (Portsmouth); 4th, James Trump (SWSA, Gloucester); 5th, Stu Barter (Chandlers Ford SC). LAST-16 (10 points): Wilson 2-1 Hughes, Barker 2-0 Budd, Blake 2-0 Richard, Lloyd 2-1 A Rice, Harvey 2-1 Mears, Bunyard 2-0 Chislett, Joyce 2-0 E Weston, Smithers 2-1 Nash. QUARTER-FINALS (12 points): Barker 2-0 Wilson, Lloyd 2-1 Blake, Harvey 2-0 Bunyard, Joyce 2-1 Smithers. SEMI-FINALS (£55, 15 points): Lloyd 2-0 Barker, Harvey 2-0 Joyce. FINAL (£200/£100, 25/18 points): Harvey 2-1 Lloyd.